After Mr Lawrence Heyworth died at Pulestre Court, Bournmouth on Tuesday 17th February 1903, his wife Rosina retired to their estate at Marwood, Devon. In 1910 she had a stained glass window installed at the Marwood Parish Church in dedication to her late husband, this is a transcript from the North Devon Journal …. “At Marwood Parish Church on Friday evening the Bishop of Crediton (Dr Trefusis) dedicated a beautiful stained glass memorial window. The donor of the window, which was executed by Messrs Bacon Bros of London is Mrs Rose Heyworth. of Earls Colne, Essex and the owner of Whitefield, Marwood. In the window are depicted with exquisite richness of colour , the three Archangels, St Michael the first of the chief of the angels of God stands in the centre clad in the complete panapoly of armour. In his left hand he grasps a tall cross and in his right hand holds an unsheathed sword, pointed to the ground. The wings are of Light Blue and in small pane directly above is the crown of victory. St Gabriel the comforting angel is represented on the right of St Michael with hands uplifted in benediction. On a scroll is the word “Ave”. To the left of St Michael stands St Raphael, the divine healer, whose left hand grasps a staff. Both St Gabriel and St Raphael have wings of Crimson and stand on a mosaic floor. Beneath the figures of the angels is the inscription “Therefore with angels and archangels and with all the company of heaven we laud and magnifythy glorious name”. At the base of the window is the inscription “To the glory of God this window is erected by Rose Heyworth in loving memory of her loving husband Lawrence Heyworth. Her Mother Susanna Ruth Bates and her step-father John Bates all of Whitefield in this parish 1910”. 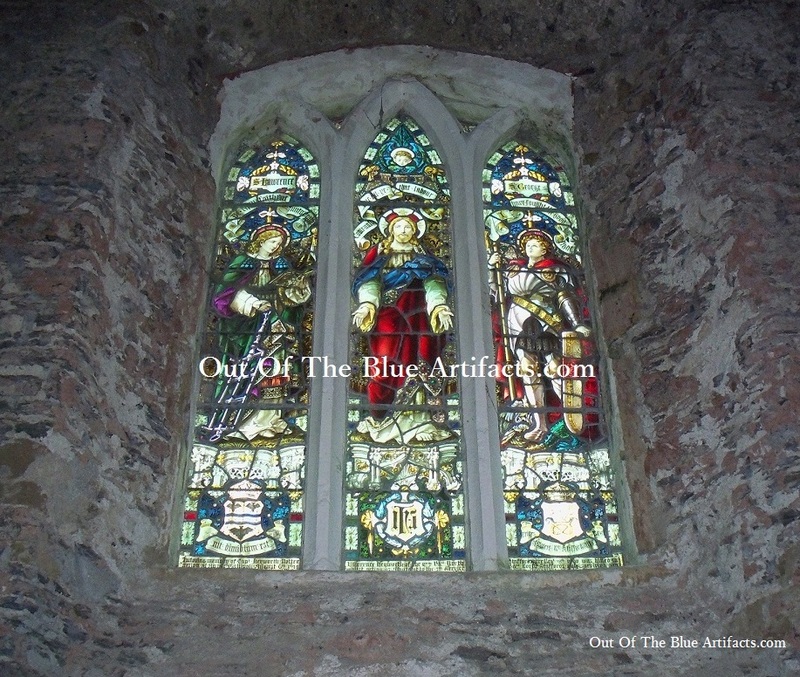 In 2013 I sent a message to the curate of Marwood asking for more information on the window. 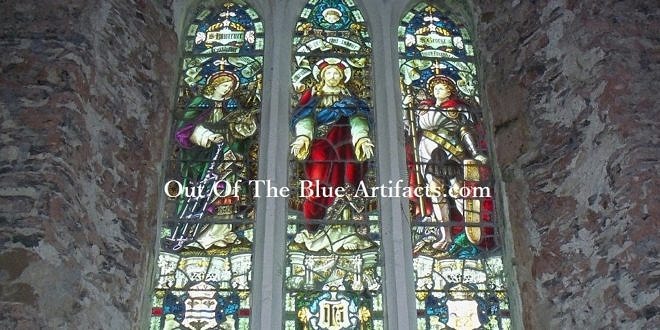 It seems that the original window was altered when a new stained glass dedicated to their son Heyworth Potter Lawrence Heyworth who fell at Gallipoli in the Great War was added to the window. “Captain Heyworth Potter Lawrence Heyworth died in August 6th 1915. Son of Lawrence Heyworth was a career soldier, educated at Harrow and Trinity College Cambridge, Heyworth Potter Lawrence first saw action in South Africa in the Boer War where he earned the Queen’s South Africa War Medal with clasps for Cape Colony, Transvaal and Orange Free State. Perhaps in tribute to his son, Colonel Heyworth later named areas of his woods at Whitefield after battles in the Boer War, including Spion Kop and Tugela Woods. Lawrence and his regiment arrived in the Dardanelles in June 1915, where two months later at the age of thirty-eight, he was killed in action near Sari Bair on August 6th. Heyworth was laid to rest at the Shrapnel Valley Cemetery in Turkey and posthumously awarded the Victory, British War and 1914 -1915 Star medals, also gaining a mention in De Ruvigny’s Roll of Honour 1914-1924. He is not mentioned on the Marwood War Memorial, though a stained glass window was later erected in his memory in the Lady Chapel of the Marwood Parish Church. This window was described as – The left hand light bears the image of St Lawrence, with the words ‘Be thou faithful unto death’. The central light is of ‘Christus Consulator’ (Christ the Comforter), with the words ‘Come unto me, ye that labour’ and on the right, is the familiar image of St George, in defeat of the dragon, with the poignant words ‘I have fought the good fight’. In the faith of Jesus Christ, we dedicate this window to the glory of God, and in memory of his servant Captain Potter Lawrence Heyworth, in the name of the Father, the Son and the Holy Ghost. Source: North Devon Journal, August 6th 1916.